Charlestown Family Activities park offers a fun outdoor activities for kids and their parents. 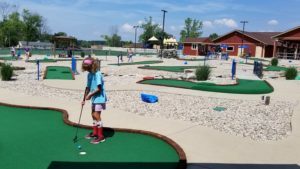 Recently, my kids and I had a chance to check out Charlestown Family Activities Park in Charlestown, Indiana. 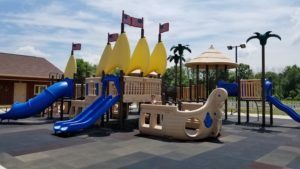 Charlestown Family Activities Park offers two options during the summer: $3 for the pirate-themed splash pad and playground only, or $5 for the splash pad, playground, unlimited mini-golf, unlimited roller skating, and roller skate rentals. The admission price is the same for anyone over age two. There is also a free skate park just in front of the park where we saw bikes and skateboards. 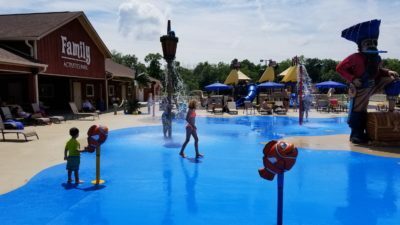 The splash pad is a square filled with about a dozen, small water features, and it is surrounded by chairs and loungers (including kid-sized chairs). The seating is mostly in full sun, but one side of the square has disappearing shade as the day gets longer. There are a few picnic tables in shade for the full day, and a row of umbrella tables between the splash pad and playground. The playground is good for little ones through elementary school age. It’s meant to be played on by kids in wet bathing suits. The kids go back and forth between the playground and splash pad. There are benches around playground, and a few tables nearby in shade for the majority of the day. With your $5 admission comes unlimited 18 hole mini-golf. The mini-golf looks brand new. The greens were in great shape (not peeling) and brick borders at each hole were in perfect condition. It’s a fun course with varying difficulty. There’s no big obstacles on the course, just greens with slopes, bumps, and pits under the green.There are two shaded areas to sit along the course, but for the most part, it’s in full sun. 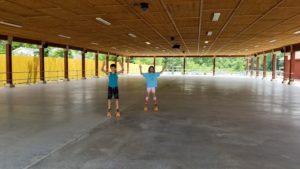 Roller skating is a big, flat slab of cement under a big roof with no walls (there can be rain puddles, bugs, and wildlife on the outskirts). The roller skate rentals are included in the $5 admission price. Be sure to have socks with you! My daughter was a little hesitant to skate because the concrete floor looked a bit rough to fall on, but she enjoyed it. It is super smooth – better than the wood flooring at our local skating rink. While we were skating, they were playing some rockin’ ’80’s music! There were two really great things about Charleston Family Activities Park: you can bring in outside food and drink and it’s super clean. There are some water fountains where you can refill your water bottles. There is a concession stand which sells mostly snack food – hot dogs, nachos, pretzels, chips, candy and soda (nachos and cheese are the most expensive item at $3.00). There are lots of tables, and it felt very safe to leave things at our chairs since they are pretty visible wherever you are in the splash pad. The bathrooms were super clean, and had big stalls for changing clothes, and a changing table for babies in both men’s and women’s bathrooms. Everything felt very clean – there were workers going around cleaning the whole time we were there. This park is also very visible in each section if you have little ones you need to keep an eye on or bags you want to keep one eye on while you play. There are no lockers. In the splash pad area, you can see the whole splash pad from your chair which is nice. There are also air conditioned party rooms you can rent fairly inexpensively (compared to a lot of other birthday locations) plus the cost of admission. Check the website for details.